This island is based on the graphic novel of the same name, Mystery of the Map. 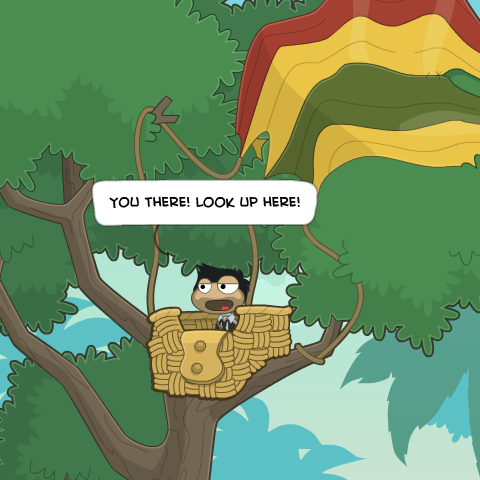 You'll drop in on one of your most exotic locales yet, a deserted tropical island. Wait, it's not deserted! Go to the right, and Octavian, the man on the blimp, will talk to you and give you a map. 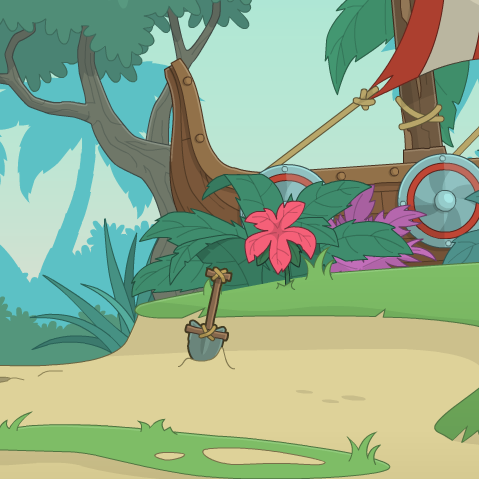 This map has the power to transport you anywhere on the island by clicking on the location, but you have only a corner of a larger map. 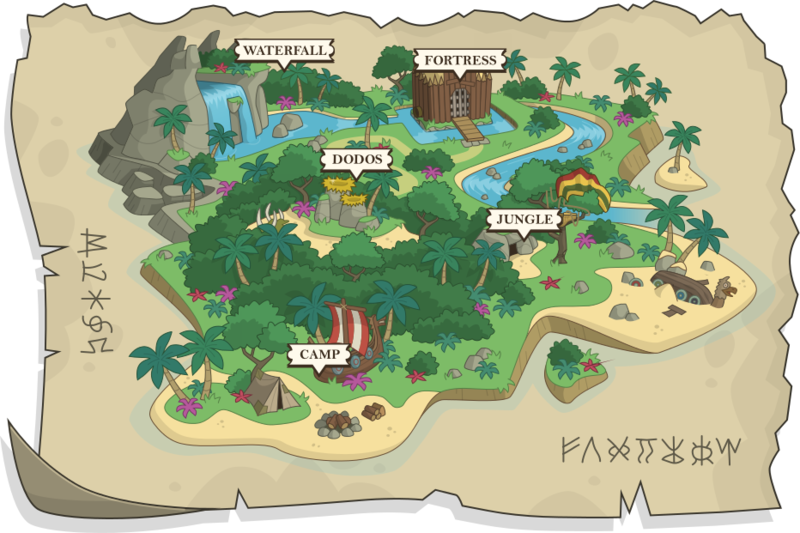 Now use the map and click on Camp, which is in the lower left. 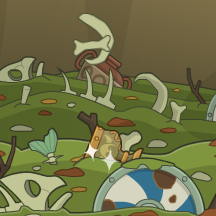 Go left and click on the shovel to collect it. Then return to the Jungle using the map. Go all the way right, past the tree with the blimp, to the beach. 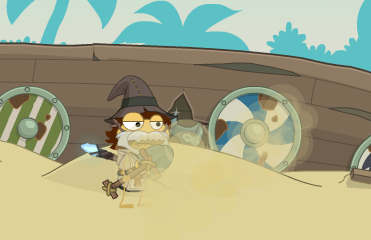 Go right to the mound of sand near the ship and USE the shovel to dig out the area. 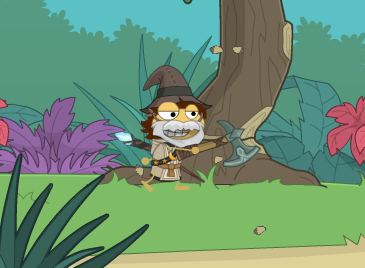 You'll discover a convenient Battle Axe. Go back left and USE the axe while under the tree. 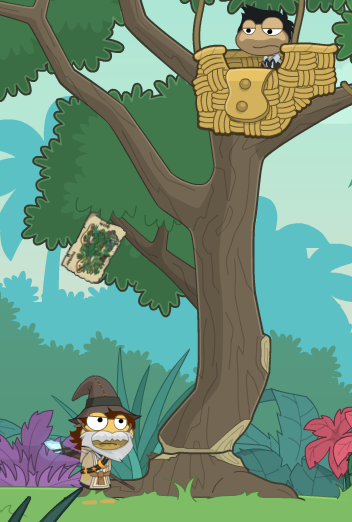 The tree will be cut down, and Octavian is free! 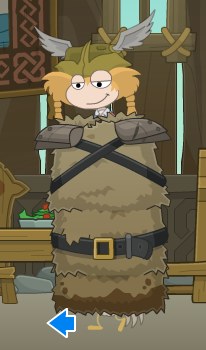 Collect the rope from the ground, and then go to talk to Octavian. 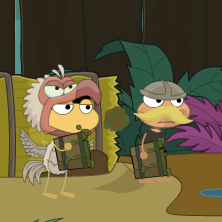 He'll tell you that there is a magical map of all of Poptropica -- imagine the power this map would give the owner! Our next lead is the Fortress. Click on it on the map, in the top. We can't enter it yet due to the heavy guard, but go underneath it and all the way to the left, to the trash pit. Go in the center (they're getting creative with the dumpster-diving variants) and pick up the goblet. Now go to the Waterfall and go under the water. Swim left until you get to the fish, then USE the goblet. You will now be holding it. 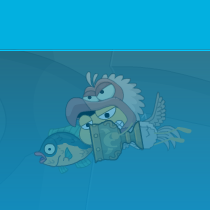 Go to a fish and click on it, and you will capture it in the goblet. Now come back up to the surface and go to the Dodos, in the center of the map. Go down and stand next to the giant skeleton. USE the goblet. 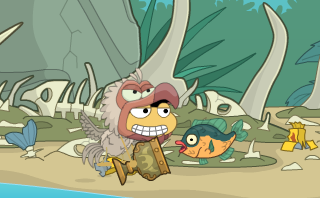 The hungry dodos will rush towards you, running off the scene with their fish, Ice Age-style. 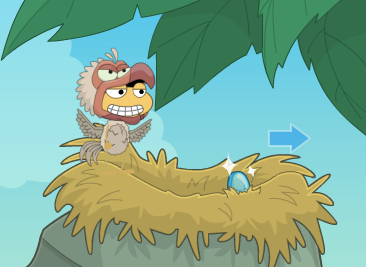 Now you can go right, climb up to their nest, and collect the blue shining lens. Go to the Fortress, then swim across to the left. 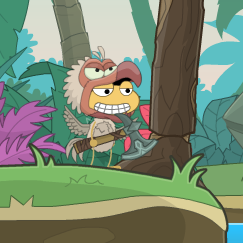 USE the axe on the wooden stump to drop it and create a bridge. Walk across and click on the trash pipe, and you will enter the building! Immediately, you'll be asked to serve drinks to the diners. *grumble* Click on the tray of drinks and go to the table. Click on the big person and he will sit down to eat. 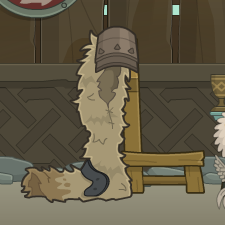 Then, grab his furs which is rested against the back of his chair. Go all the way left, into the throne room. Here, Erik the Red is holding a trial to get his goblet back. Whoops... now how do we give it without bringing blame upon ourselves? Go back to the main hall and grab the tray of drinks. USE the goblet, and you'll put it in the tray. Then take the tray back to the throne room and serve drinks to everyone. Thorlak, on the left, will take the goblet and invoke the wrath of his brother! He'll throw his crown. Now go right and pick up the crown, then go right to the main hall. Jump up to the mantle of the fireplace, and grab the pot of drippings that are there. Go all the way right, to the room marked by a pig. Aha! 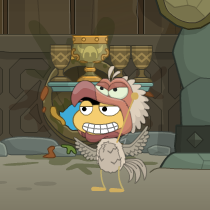 So Octavian is the villain after all! The guard will come in and you can't go any further. USE the drippings, and he will be run over by a horde of stampeding pigs! 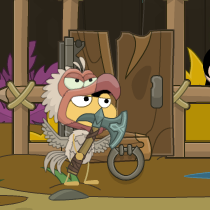 Go right and USE the axe to break the lock open. Woohoo! A free candy bar from Jorge... a half-eaten one... anyway, now we have to find a disguise. Turns out we already have one! USE thee furs and the crown. All four of you can pile into the gigantic suit, and walk out the hall to the chute But It's not that simple. The tower will start to bend, and you can't let it hit the ground. To avoid that, walk in the direction of the bend. If it's bent a lot, run; otherwise, walk slowly until it is only slightly bent. If it's slightly bent to the left, don't keep going until it starts to bend a little more. That way, you don't topple over in the opposite direction. Finally, you're at the chute. Uh-oh... here comes the big guy! Now you've all escaped, but you're on the waterfall, heading for certain doom! In addition to that, Big Red is chucking boulders at you as you try to navigate the stream. You can hold the mouse and drag to move the raft. 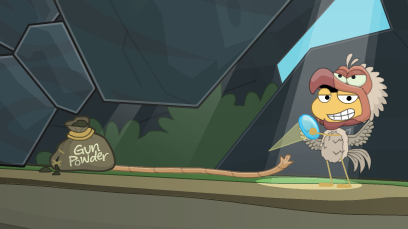 Since moving back is slower than moving forward, you should start moving back right after he has thrown a boulder, then shoot forward to dodge the next one that is coming. Repeat until you reach the end of the falls, and are violently launched off. Woohoo, we escaped the Vikings! But wait, there's more... Octavian! We've got to trap him here. Throw him a candy bar. He'll catch it reflexively, then... the dodos start chasing him! Thankfully for us, he will merely run away rather than dropping the bar. Hooray, the map has been reclaimed! Now claim your gold medallion. 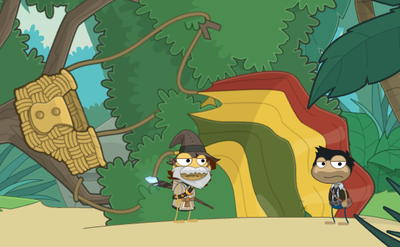 Another island quest conquered... but this isn't the last we'll be seeing of Oliver, Jorge and Maya.